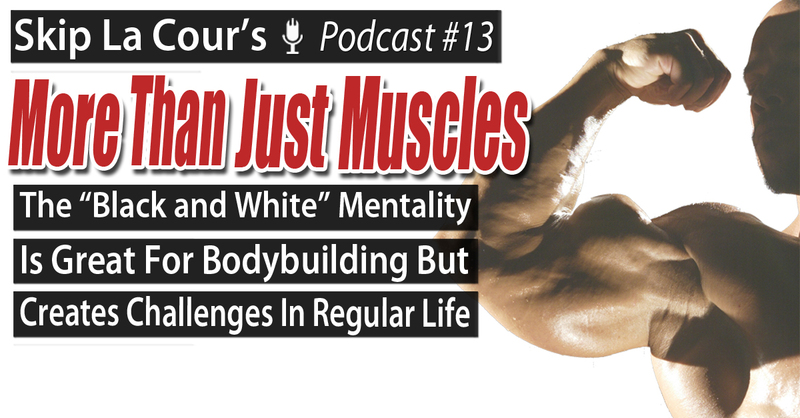 During this podcast, Skip La Cour explains why the “Black and White” Mentality is great for bodybuilding but creates challenges in regular life. What to get on your path to become “More Than Just Muscles.” Go to <a data-cke-saved-href=”http://www.skiplacourcoaching.com/more” href=”http://www.skiplacourcoaching.com/more” target=”_blank”>www.SkipLaCourCoaching.com/more</a> and explain why you absolutely must do so now in order to experience the overall quality of life your really want. <strong>Skip La Cour</strong> is a six-time national drug-free bodybuilding champion who has been a leader in the bodybuilding and fitness world for over 25 years. He is a success coach, speaker, and business owner. Skip helps ambitious men understand and execute effective leadership and influence skills so that they reach their goals in life with more clarity and confidence.